Here is another fun group of food and wine mysteries-Batter Off Dead: A Southern Cake Baker Mystery by Maymee Bell, One Taste Too Many: Sarah Blair Mystery by Debra H. Goldstein, Steamed Open: A Maine Clambake Mystery by Barbara Ross, Wine and Punishment: A Literary Pub Mystery by Sarah Fox, Live and Let Pie: A Bakeshop Mystery by Ellie Alexander, Kappy King and the Pie Kaper: An Amish Mystery by Amy Lillard. Details at the end of this post on how to enter to win a copy of all 6 books, along with links you can use to purchase them. If you have ad blocker on you won’t see the Amazon links at the end of each review. For Goodness Cakes bakery owner Sophia Bell is putting her New York-trained pastry skills to good use in her Kentucky hometown as she crafts exquisite desserts for their local library fundraiser. The Heart of the Town event is being held at the Grape Valley Winery, where librarian Catherine Fraxman hopes to coax wealthy Rumford Country Club members into emptying their pockets to fund the new library addition. They appear to have achieved their goal early when businessman Ray Peel promises to donate half-a-million dollars, until he rescinds his offer and lets it be known that he plans on selling the land being leased by the winery. With the library project possibly halted, Cat in danger of defaulting on the loan, and the winery possibly getting shut down, no one should be too surprised when Sophia stumbles over Ray Peel’s body. Unfortunately, Sophia’s good friend and ambitious real estate agent Madison Ridge had been overheard threatening Ray when she learned that he planned to cut her out of the sale, and when she becomes the primary suspect there’s no way Sophia’s going to allow gossip shuttle Madison along to prison. 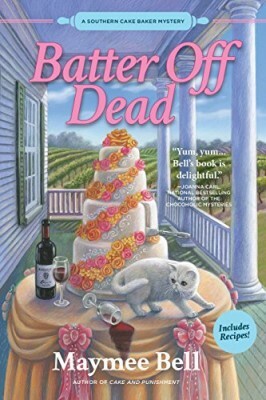 If warnings from both her exasperated socialite mother Bitsy and Sophia’s boyfriend Sheriff Carter Kincaid can’t prevent her from investigating, it should also be no surprise that anonymous coupons, bricks through windows, or even a break-in into the bakery will have Sophia sitting out on the sidelines. Sophia’s love for her friends and family are what spurs her impulsive and enthusiastic interrogations of the wide array of suspects. Ray had a pattern of breaking promises, so there’s no shortage of furious former business partners who may have wished him dead. Sophia can sympathize, as having never received her full payment for her pastries For Goodness Cakes is definitely straining its credit limits. A delightful distraction is Bitsy and her endeavors with the Garden Club plant and flower exchange, with an observant Sophia quickly recognizing her mother’s own shenanigans. Sophia’s dream of making the world happier through her baked goods helps her to put together pieces of a much bigger puzzle, as she knows the meaning behind knowing another person’s taste in flavors and sprinkles. This is a fun mystery full of Southern humor, a heroine willing to risk everything for her friends, and more than enough recipes and descriptions of pastry making to delight any foodie. Sarah and Emily are twins but certainly not identical. Emily is CIA-trained, the Culinary Institute kind, while Sarah is lucky to make Jell-O. Emily is hard-working as all chefs are, but Sarah is a receptionist for a lawyer who tends to hide the filing in the bottom drawer. Emily is single; Sarah divorced. Emily lived in California; Sarah stayed home. One thing is sure—they are devoted to each other. Sarah’s ex Bill had money, some of his own, some from his mother. When he and Sarah divorced, Sarah ended up living in a one-room apartment with her former mother-in-law’s Siamese cat, Rah Rah. Emily is back in town and aiming for the job of sous chef under Chef Marcus, who has his own restaurant and a catering business. The worst part of the job is Bill’s part owner and Jane, Bill’s girlfriend, is also after the sous chef job. When Emily finds Bill dead, she’s the obvious suspect. Sarah can deal with Bill’s death but not with Emily’s involvement in the case. She’s got to snoop. 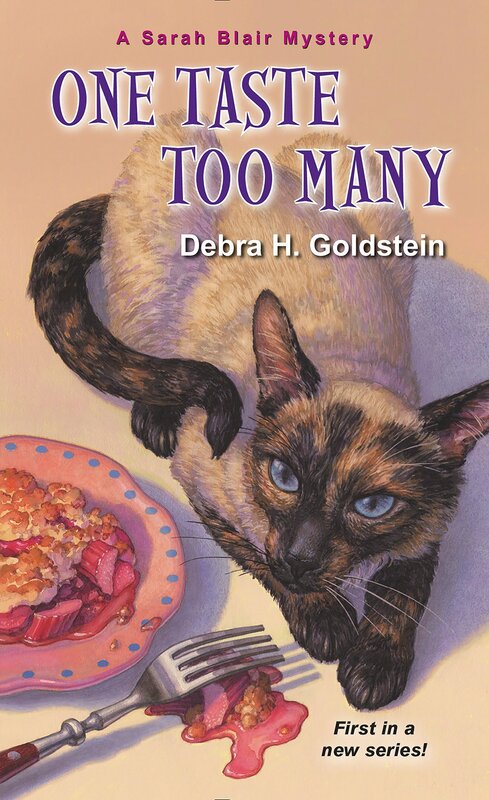 For a look behind the scenes at the hectic lives of those who make fabulous food, and those who can’t, plus a tale of two sisters and one cat, this mystery will leave readers guessing right up to the end. There are a number of suspects with motives, twists and turns, red herrings and clues, misdirection and misleading conversations, all wrapped up to make a great story. This is the first in a series that puts characters into changing situations as the book comes to an end, promising the second book will be just as tasty. Sarah generously shares her recipe for spinach pie (frozen spinach soufflé, pre-made pie crust) and Jell-O in a can (with pineapple). What could go wrong? Busman’s Harbor, Maine, is a tourist destination in the summer and strictly townies in the winter. You have to make your money during the season in order to survive the winter. Fresh seafood is a big draw, as are the lighthouses and open sea. Each morning clammers stake out their territory and as the tide recedes, they get to work. Clambakes are a big draw in the area and none is more popular than the Snowden Family’s. The ferry will wind its way past sites worth seeing, then visitors can hike, explore or just sit, and wait for the clambake meal to be ready. Serving two groups a day is wearing, especially doing it with a smile. When one prime spot is closed to the public after many years, the townspeople are furious. A death soon follows and in spite of locked gates, there are a number of suspects. Secrets are bound to come out and while necessary, it isn’t always a good thing. Julia Snowden is a sensible woman. She asks questions but doesn’t put herself in jeopardy, at least not on purpose. Her relationship with Chris is a good one, each giving other space when needed, understanding the demands of the season. The Snowden family works together and even though that can be a pain sometimes, they have managed to work out any bumps. The books are a fascinating look behind the scenes of a popular tourist spot. The visitors arrive, catch some sun, eat, and leave while the folks who live there are working long hours to provide them with a day’s fun. It’s hard for people with regular paychecks to understand seasonal work and the need for multiple jobs. This is the seventh book in the series. Each one feels like a mini-vacation without the need for sunscreen or the danger of overeating. Be warned—you will be very hungry. Luckily, there are recipes for Livvie’s Linguini with Clam Sauce, Peg’s Famous Clam Dip, Clam Potato Casserole (there’s bacon and cheese, too). But it’s not all clams with Vee’s Raspberry Muffins, and Ma’s Sour Cream Coffee Cake. You won’t starve. Don’t forget to read the “Acknowledgments” for additional insights into the series. Sadie Coleman broke up with her boyfriend Eric, lost her job in a merger, and fled to Vermont to visit her aunt while figuring out what’s next. Once there, she saw no reason to leave and instead, started her own business, a literary pub. It’s in a refurbished grist mill which lends a lot of atmosphere. There are rooms for book clubs to meet, too. It’s been four months, and she’s on her way to an Eric-less life. Until, just as she’s entering the pub from her upstairs apartment, Mel, her bartender, lets her know Eric is on the other side of the door. A quick slip out the back and Sadie is able to avoid seeing him. When his body is found, she’s a likely suspect because of their relationship, and he didn’t know anyone else in town. Vandalism, rumors, and sly remarks make her wonder who she could have offended and how. Her alibi clears her of Eric’s murder, but she feels she owes it to his family to find out who killed him. This is the first in a new series. Sadie is an interesting character but a bit too eager to go to a suspect’s house and peek in windows—she is not good at it! By asking questions, she’s able to find out much more. There’s a brewing relationship with the owner of a neighboring craft brewery, an Autumn Festival with pumpkin catapult, and pumpkin pie contest, a couple of fires, and Wimsey the Cat who acts as her alarm clock. I did figure out the killer but only seconds before Sadie did. The suspects all had good motives and for the most part, opportunity, which will keep readers guessing. I look forward to the next book to see how the potential relationship moves forward (or will it? ), and the expansion of the kitchen. Included are recipes for Huckleberry Gin, Huckleberry Gin Mocktail, Happily Ever After (tropical drink), and Carrot Muffins. Fox also writes the Music Lovers series (3), and the Pancake House mysteries (4) with a taste of Yeast of Eden, at the back of this book. Jules is running Torte, the bakery/eatery/fun place to be. It’s a family tradition, but now that her widowed mom has married again, Jules is in charge. She’s overwhelmed by construction for a new addition at the shop but knows it will be a huge success when done. Success means more employees. Most of the new hires work out great and that allows Jules to take a bit of time off now and again, like when her mom wants to house hunt. At an open house, they meet Stella, a ruthless real estate developer. When inspecting an almost vacant lot, there’s Gretchen who works with the homeless or as she calls them, the unhoused. Viable land is scarce in town, and Edgar owns a prime lot. Everyone thinks they have the sale sewn up, but do they? Jules has a lot going on besides training new employees, renovation of the restaurant, and her mom’s house hunting. Jules is separated from her own husband who still works on a cruise ship. He’s willing to try life on land, but she’s not so sure. Jules is also part owner in a winery. She caters and does custom cakes. Time away from the shop is essential in order to keep going. When a pair of little girls dive to find underwater treasure and instead surface with a human skull, Jules is on hand to call 9-1-1. Aided and abetted by Lance, an enabler or instigator, the pair ask questions, delve into the past, and dodge danger in the present. This is the ninth book in the series. Jules is somebody you’d want to know. After all, she can cook and has a recipe for fluffernutter sandwiches, an updated version with Nutella and bacon. Beware of Lance, he’s charming enough to get you into more trouble than you can imagine. 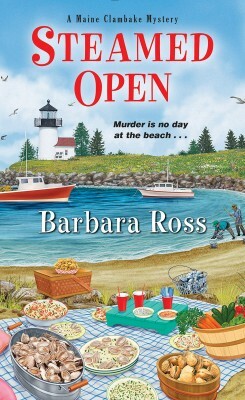 The plot and subplot work well together, as she tries to find out more about the long-ago dead body and a current corpse. Are the deaths related, stemming from love gone wrong, ancient grievances, secrets, or does it all just boil down to greed? Jules shares recipes for savory dishes (Chicken Cacciatore and Summer Minestrone Vegetable Soup), Cherry Almond Hand Pies, Raspberry Bars, Andy’s Affogato (an espresso drink that’s “dessert in a glass”), and thankfully, the Fluffernutter Sandwiches made with brioche bread. Although she belongs to a moderately conservative Amish community, Kappy King is rather unconventional. 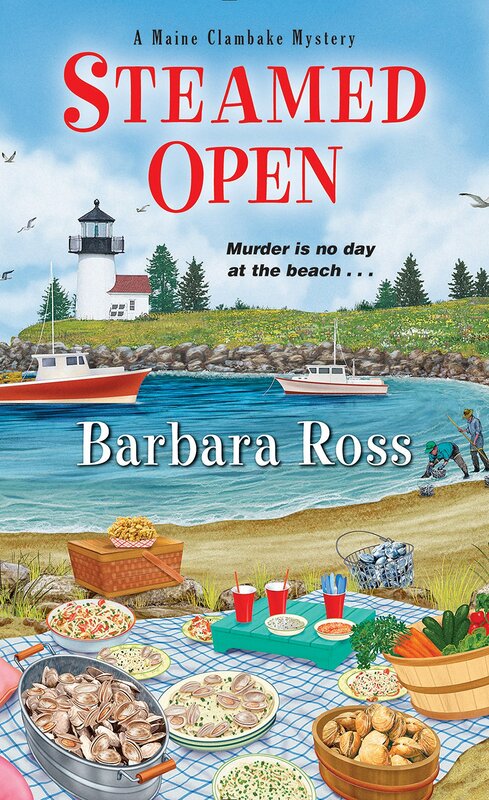 She likes reading mysteries, indulges in a bit of gossip, is best friends with the shunned Edie, and sometimes helps solve murders, much to the dismay of Detective Jack Jones. 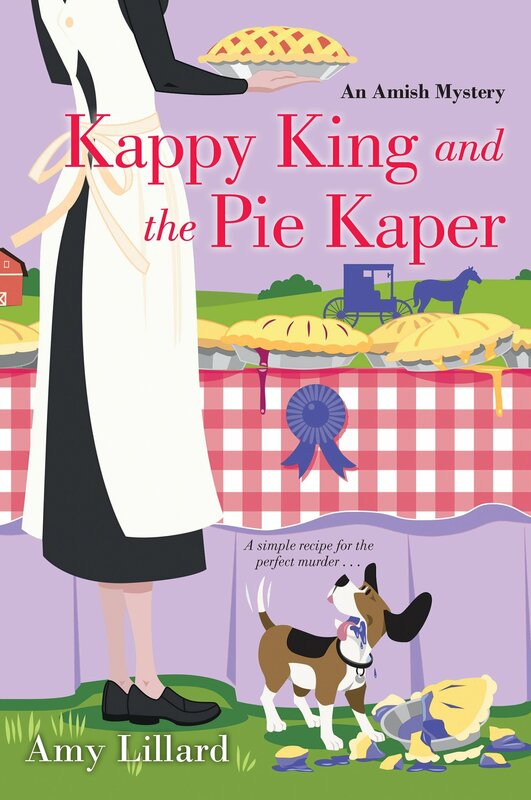 It’s time for the annual fall county festival, and Alma always wins for her boysenberry pie. This year, instead of the usual array of flavors, all contestants will make the same kind—boysenberry. If Frannie Lehman thought she’d have a chance against Alma, the choice of boysenberry killed that idea. The idea isn’t all that’s killed—or almost. Alma is found on her kitchen floor, unconscious, the floor covered in flour. The thinking is she was getting ready to bake when the attacker came into the house. 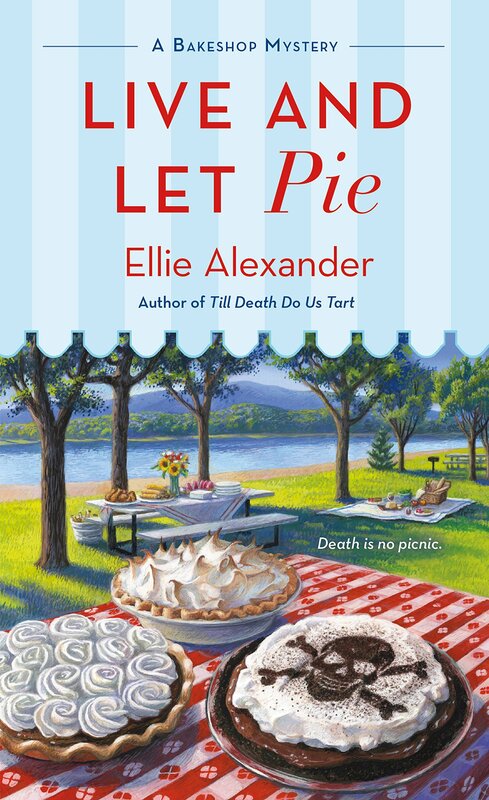 With Alma hospitalized in an induced coma, talk runs rampant, equally between who did it and who will win the pie contest if Alma can’t compete. It’s not just pride on the line. The Amish are told pride is a sin. A representative of a national line of bakery goods is one of the judges. What if she’s scouting for new recipes? Kappy and Edie try, with the help of Jimmy, Edie’s brother who has Down Syndrome, to make sense of the clues left behind—a missing quilt from a break-in at Alma’s, a series of words written in the flour, and long buried secrets. Whether traveling by buggy with Kappy at the reins or by car with an inattentive Edie driving, the friends manage to cover a lot of ground while casually asking a few questions here and there. Jimmy comes up with helpful information, surprising even Kappy, who always says, Jimmy is capable of more than Edie thinks. Kappy and Edie are opposites, from Kappy’s Amish dress to Edie’s lime green jeans and pink shoes. Jimmy and his animals—chickens, goats, rabbits, and beagles—are a delight. Where Edie might be apt to run headlong into danger, Kappy’s common sense prevails, most of the time! Added pleasure is the possible romance between Edie and Jack, where neither of them knows exactly what to do next. For a look into Amish life, this entertaining series also delivers a good puzzle. This is the third of the Amish mysteries. Lillard also write the Well’s Landings series (8) and the two Pontotoc Mississippi books. To enter to win a copy of all 6 books, simply email KRL at krlcontests@gmail[dot]com by replacing the [dot] with a period, and with the subject line “food and wine,” or comment on this article. A winner will be chosen February 2, 2019. U.S. residents only. If entering via email please include your mailing address (so if you win we can get the book sent right out to you), and if via comment please include your email address. You can read our privacy statement here if you like. Holy Cowzaroonies… what a line-up! Loved the article & Thank You for the Awesome opportunity to snag these! What an amazing giveaway! Thank you so much! I’d love to win this collection. chance to get them all. I would love to add these to my library! Thank you for the great give-away. I would love to have the opportunity to read all of these books. Your blog is an enjoyable way to find out about new books and their authors. Awesome giveaway! Would love to win these! ? A really great selection of books from great authors. Thanks for the chance. Thank you for the reviews and the giveaway! Thanks for a chance to win some very interesting sounding books. I love a good mystery. My NY resolution is to read more printed books. This giveaway would help! Thank you for this opportunity. I’d love to be able to have and read all of the books. I love all of her books!!! A great line-up of books to read. Thanks for the chance. All these books sound wonderful! What a great contest. Thanks for the opportunity to win! The covers are great. makes me want to read them all without even checking the blurbs. What a great newsletter! Thanks Tonya for clueing me in! More authors to get to know! All good things! What fun! A caterer offers me a glass of wine before the clam bake begins. Then on to dessert. A choice of two pies and to top it off, I get to eat cake too! Error in my email address in my previous comment. Sorry. I love giveaways, especially ones that have books from my favorite authors! Wow these sound like some great reads. Thanks for the chance. I love the titles and plays on words! What an awesome group of authors and selection of books. Thank you for the great giveaway. Thanks for a chance to win these great books. ? What a great selection of books! Thanks for chance to win them. This is a fantastic giveaway! What a great selection of books. Thanks so much for the chance! Thanks to the authors for their generosity! Thank you for setting up such generous giveaway opportunities. I try to not miss any book in any series and hard copies make it so easy to share! This would be a great collection for me to take on vacation in March! A great selection of books the one by Sarah I have read and that was so good. Thanks for the chance! These are all authors I’ve never read except Maymee Belle, aka Tonya Knapps. Tonya’s books are some of my favorites with great plots and fun characters. One TasteToo Many especially interest me because I have identical twin boys and they are defiently different. All these food and wine mysteries sound intriguing. This is such a great giveaway. All these books and authors sound like so much fun. Thank you for the chance. These books sound both fun to read and delicious! I would so love to win these books. I just love your reviews. Thank you for doing this for us. Sounds like a great collection of books. Would love to win one or all of them! What a great giveaway!! Super nice!! Would love to win and thanks for the chance. Thanks so much for the chance to win all these wonderful books. Looking forward to reading them! I love mysteries! Thanks for the chance to add to my collection. Awesome book selection! I’m hoping to read Maymee Bell’s books soon. That Maymee Bell can sure make you laugh! Thanks for this great prize pack! This group of books sounds amazing! Love this author. She has such interesting characters. Wow! What a great lineup of books! I saw some favorites as well as some new authors to give a try. Thank you! These books sound fabulous! Would love to read them all. Thanks for the opportunity! A great selection of books this edition!! Two written by “new to me” authors. What a fun lineup…ready to read! Wow! What a wonderful pile of reading!!!! 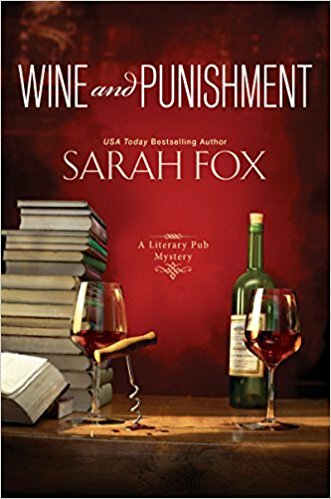 Food and wine mysteries, what a great collection especially when we’re experiencing -25 degree temperatures and want to snuggle up with a good book! Wow! What an Amazing Giveaway! Thank You so much for the Chance to win! Thanks so Much for the Chance to Win these Amazing Books. Great post-a couple are new to me, others are faves I have been looking forward to! Thanks! We have a winner! I hope you all keep coming back and that you consider checking out our mystery podcast!